For the third time this inaugural League1 Ontario season, it is Toronto FC Academy striker Molham Babouli taking Player of the Week honours, this time courtesy of a tally to keep a rampant Sigma at bay, and a nine-minute hat-trick versus ANB Futbol the next day. Babouli took over at the top of the golden boot race early in the season, and has led the goalscoring charts ever since. 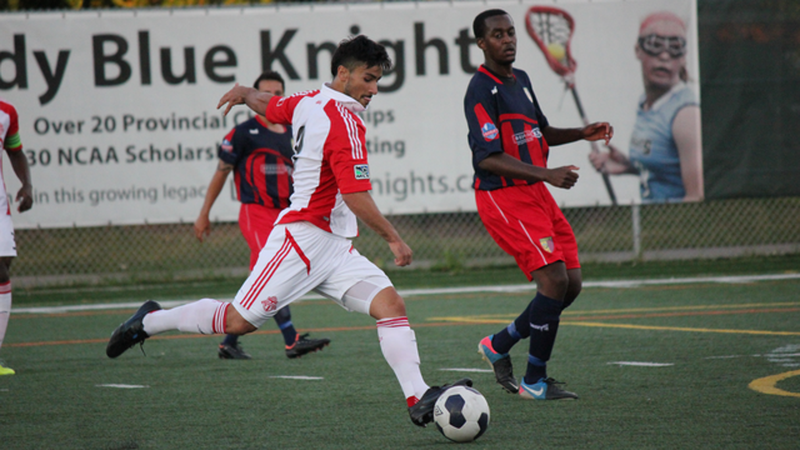 With the season winding to a close, and twenty-one goals to Babouli's name – second place challenger Andrew Ornoch of Vaughan Azzurri is on eleven goals – it is more than likely he will ultimately take the golden boot. So what is his most memorable moment? “I would say the best performance I had was the last [ANB] game,” reveals Babouli. “I came on in the second half, and one of my best goals this season was the free kick I scored. The only reason I would say that – it's not because of the hat-trick or anything – but that I usually play as a nine or false nine, but due to the circumstances I played as a right wing." For aspiring young strikers, Babouli suggests training one's spatial awareness, and an understanding of the opponent's strengths and weaknesses. Coming out of the OYSL system via the Dixie club, Babouli points to significant differences between amateur and professional environments.